What makes an episode of Supernatural work? Partly, it’s an ability to commit to and nail one of the show’s many possible tones—from standalone horror film to epic mythology romp, the show is capable of being several different things in any given week, but is generally speaking unsuccessful when it tries to do more than one of those things. One of those voices, and one I’m particular fond of, is Supernatural’s highly self-aware storytelling. Some of the series’ absolute highs have come from the writers poking fun at the tropes they’ve relied on in episodes like “Changing Channels” or “The French Mistake,” so an episode literally titled “Meta Fiction”—especially one that starts with Metatron aping the beginning of Masterpiece Theater—was bound to get my hopes up. For the most part, “Meta Fiction” delivers on that promise. Start with Thomas Wright’s direction, which, in a running theme for this season, is pretty snappy. Several of the choices, like the zoom in on bloody handprints as Castiel silently discovers the bodies at the beginning of the episode, calls attention to the ways in which “Meta Fiction” is, itself, a story. And when was the last time an episode of Supernatural and an episode of Mad Men began the same way, airing two days apart? Both “Meta Fiction” and “Time Zones” start with characters (both middle-aged men, at least visually) talking directly to the camera (and therefore the viewer), making statements about the nature of the story they’re about to see. Where Freddy Rumsen turns out to be pitching Peggy Olson on an Accutron campaign using Don Draper’s words, Metatron’s queries about the nature of stories at first seem to be directed at the viewer, creating a self-contained fictional world in which he is truly a god before being revealed as a mustache-twirling lecture to Castiel. Both choices contribute to a break of sorts, calling our attention to the nature of the storytelling as it’s happening. In both cases, there’s a slight sense of the uncanny as the fourth wall is broken via the close shots of actors talking to the camera—even if we know that, for example, Freddy isn’t talking to viewers in the year 2014, “Time Zones” certainly gives off the illusion that he is, and we take his words accordingly. The use of that shot also invites a sense of camaraderie with Metatron, contributing to the way that “Meta Fiction” gives (or tries to give) us a sense of who Metatron actually is. The storytelling (and hoarding) angel has been a villain since last season’s finale, when he betrayed Cas to cast the angels out of Heaven, but he’s been a sparse presence for most of this year, primarily working through Gadreel and showing up to smirk every once in a while as the demons and squabbling Earth-bound angels take on primary heavy duties. Here, we get a real idea of just how much Metatron has absorbed from all of the stories he’s read in his years of self-imposed exile, particularly when Metatron gives all of the art he has consumed to Castiel (why couldn’t he do that for me? ), a process that I hope will at the least escalate Cas’ ability to make reference gags, but will almost certainly come back to provide him with some military tactics or something during a climactic fight. And Curtis Armstrong continues to play Metatron with the right level of smarm, perfectly capturing the way that the best villains see themselves as the heroes of their own stories. Indeed, sometimes during “Meta Fiction” it’s hard not to shake the feeling that Metatron is speaking for the writers, and in part justifying their pulling of the character’s strings. “My job is to set up interesting characters and see where they lead me,” he says. Several of those interesting characters help lead the episode along. In additional welcome villainy, Tahmoh Penikett returns in full as Gadreel after many weeks of the character being performed by Jared Padalecki. He’s not given a lot to work with (mostly glowering about stuff Sam feels), but he still sells the angel’s grim competence as well as he can. And, in more exciting news, Cas spends the first half of the episode looking another leader for the angels, but one finds him in the form of Gabriel because Gabriel is back (for a few minutes, at least), naturally showing up in Casa Erotica 14. The presence of Gabriel calls back to, among other episodes, “Mystery Spot,” one of the best hours the show has ever done. Richard Speight, Jr. continues to be delightfully smarmy in the role, even after a few seasons’ hiatus. His only false note comes in the scene of Gabriel and Cas in a convenience store, Gabriel telling Cas to be a leader for the angels, damn it, because the trickster would never be that self-sacrificing (or at the very least that boring at being righteous). 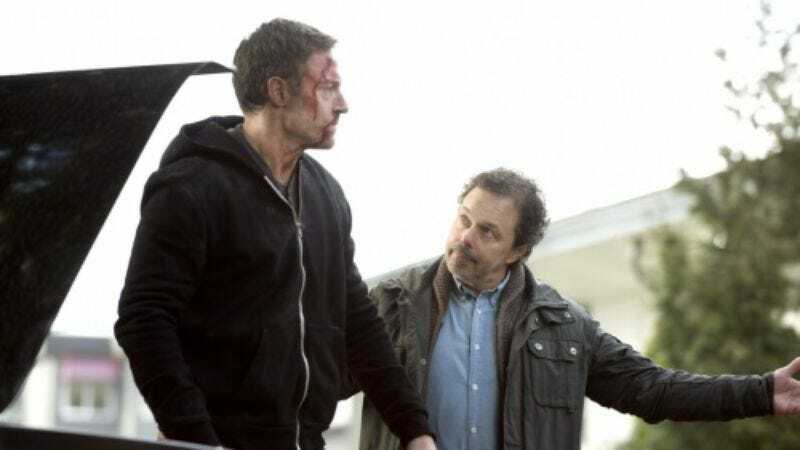 Luckily for character continuity, Gabriel is just a fictional character story being told by Metatron as an attempt to get Cas to fill a certain role in his predetermined story (a tactic that raises some questions about the writers’ season-long plotting choices and the often spotty ways they get from point A to point B). The reveal that Gabriel isn’t real (and is probably actually dead, though who knows) is indicative of my big problem with the episode. After the cold open calls attention to the artificiality of the story as a framing device, the rest of the episode should play out almost as a dream, or at least something substantially weirder than the show normally goes in for. But other than the Masterpiece Theater bit, Metatron’s evil raising of metafictional questions about storytelling and sources of meaning, and the return of Gabriel, most of the episode is downright conventional. The twist is pretty standard, as is the angst and Winchester infighting Gadreel tries to provoke while he’s being held captive, and the final stretch of the episode, in which Metatron sets up a hostage trade with the Winchesters and blows through their angel traps, is a straight-up Supernatural showdown (though it remains to be seen why Metatron is able to evade all of those tactics that work on most angels). Metatron certainly appears formidable there (though still perhaps less menacing than Abaddon), but his attention to the conventions of storytelling mainly serves to remind us of the inevitable resolution to his attempts to become a new god. The angel claims that he knows he’ll be victorious over the Winchesters, though he’ll “enjoy” watching them try, but we’re in the opposite position—we know, because of the demands of Supernatural’s storytelling, because of the tropes of this sort of show, and because the show has been renewed for a 10th season, that the Winchesters will defeat Metatron, Crowley, Abaddon, and whoever else comes out of the woodwork this season. Sticking to one of the show’s outsized, colorful tones, as “Meta Fiction” mostly, but not entirely manages to do, is all the more important when the plot outcome is never really in doubt. Sorry for being super late on this one—I was engaged in my own telling of biblical stories. “Oh, crap. I really hate continuity errors.” Same, dude. The idea that Cas’ borrowed grace is “burning” him doesn’t matter yet, because Cas hasn’t run out of juice yet and would never accept Metatron’s offer, but it seems a bit lazy to introduce it this late. If I’m wrong, and this has been mentioned before, let me know.